The Peppermint Lounge in session on The BCB Sessions! We had a treaty treat on Wednesday’s show – a session from The Peppermint Lounge. They’re based in Leeds and their music’s really hard to describe but reminds me of The Beta BandÂ &Â Hot Chip – not bad eh! Also Phil Collins’ vox made an appearance – not something I’d usually big up / do but it’s a top remix from a local outfit. We’re offering you the chance to win Graham Coxon’s latest album – check Albert’s blog for details. Deadline’s midnight Sunday 13th Dec 09. If you missed the programme,Â no worriesÂ - Â it’s repeated on Saturday at 7pm (12th Dec). This entry was posted in Competitions, Interviews, Playlists, The BCB Sessions and tagged album, channelizer, competition, electro pop, esSDee, Graham Coxon, Heads we dance, irn mnky, phil collins, playlist, session, the peppermint lounge on December 10, 2009 by Laura. Recorded two sessions this week and I’m totally chuffed with them both. The first is with The Peppermint Lounge who’re gonna be the session guests on Wed 9th Dec – think Hot Chip, Beta Band and drinking cocktails somewhere tropical. 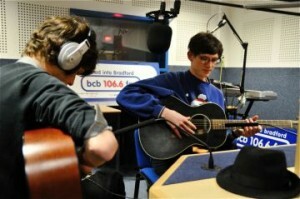 The second was with Ben Peel – Bradford lad doing acoustic solo stuff. Just done his first single and we’ll be playing it on the show. And to top it all off I had Heads We Dance in for a chat and to sort out which of their tunes we’re playing on 16th Dec (one will defo be their latest single Take My Picture). All excellent stuff – creating very happy days! Oooh and on Wed 9th Dec, I’ll be bringing you an interview with DJ esSDee & Alphabetics – top hip hop. Here’s the playlist from Wednesday 2nd Dec. Get in touch if you’ve got something you think I should be playing! This entry was posted in Playlists, The BCB Sessions and tagged ben peel, beta band, DJ esSDee & Alphabetics, gigs, Heads we dance, hot chip, playlist, The BCB Sessions, the peppermint lounge, the red pills on December 6, 2009 by Laura.